On Saturday August 28th, Magna’s Historic Main Street will host the first annual Main Street Arts Festival. 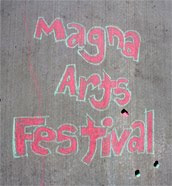 The festival is presented by the Magna Arts Council. This special event will include food, music, dancing, art exhibits, a raffle, activities, and more. Painting, photography, writing, sculpture, drawing, and other creative works, will be on display. Main Street will be closed to traffic on Saturday to make room for vendors, artists, games, and more. Twelve live bands will be playing, and other special performers will be entertaining people on the street. There will be games and activities for the kids, and other events to participate in. There will be something exciting happening all day! Prize Drawings will be held at the top of every hour at the Main Stage. Visit a vendor or business on Main Street to get a raffle ticket. All businesses on Main Street will be open and many will be having special offers during the festival. Free Sidewalk Chalk all day! For more information, and a complete lineup up bands, entertainment, etc., visit their website. Make sure to stop by the Xpressions By Angie vendor booth and say hi! She has some great stuff!